A variation of hot plate egg tofu dish. I do not have an iron plate at home, and hence, I used stir-frying method to prepare the dish (maybe I should just try heating up a fire-resistant metal plate to serve this dish next time). 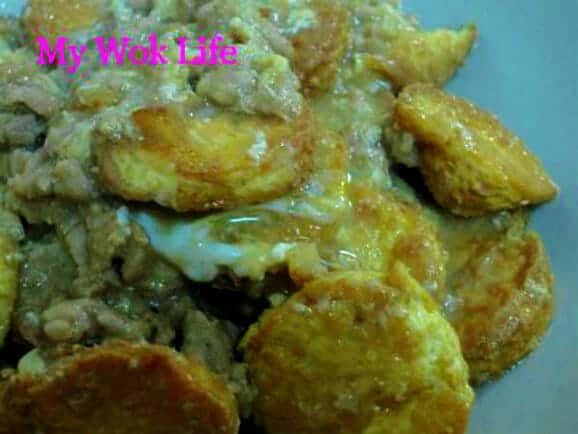 Without extensive ingredients, such as, crab meat sticks, prawns and mushroom shreds, and lack of sizzling effect, this simply an egg tofu homemade dish, with just the minced meat added (these were what I had in my refrigerator the other day… :D). Simple homemade dish, but likeable by most children! 1) Cut each roll of tofu into pieces of 1cm thick, lengthwise. You may place tofu on a sheet of kitchen towel to dry out excessive water in the tofu. 2) Heat wok with oil over high heat, and deep-fry tofu till golden browned. Remove from wok, and drain on kitchen towel. Set aside. 3) Remove excessive oil and left only about 1 tablespoon in the wok, heat at medium flame. Slightly brown garlic, add in mince meat and water. Stir-fry well for 3 minute before adding in seasoning (and also rice wine, if desired). 4) Thicken gravy with cornstarch slurry, if it still appears watery (You may adjust the adding of cornstarch slurry till you find the right consistency). Then, break and add an egg into wok, stir it vigorously for few seconds. Heat off immediately. 5) Return golden browned egg tofu into wok, stir it gently just to combine well, and dish up. Alternatively, place egg tofu on serving dish and pour over minced meat gravy. Serve with hot steamed rice. If you think my dish lacks colourful appearance, garnish with scallion and chilli juliennes. Or, vary the toppings with seafood mixture instead! However, doing with just the minced meat, it means less complication, less preparation time & less hassle to cook (smile)! A portion golden egg tofu with minced meat & egg sauce counts about 180kcal. Tips: Get tofu suitables for frying/ braising use. It’s easily available at most supermarkets. * Do not over-fried the egg tofu in order to retain its moisture and soft texture. Quickly remove from oil once it’s lightly browned to allow standing time. * Just add the egg directly into wok without pre-beating it. Egg should be added at the very final stage of cooking when it’s almost time to dish up. It’s to retain its runny texture and mouthfeel. what do you mean “made into slurry with 2 tablespoons of water” for the cornstarch? I thickened my gravy using corn starch slurry. How to make corn starch slurry? Simply use some corn starch mix with some water, stir till dissolved. Then pour into your dishes. Your watery sauce in the dish will be thickened. Yes, you add water to corn flour till disolved. I am not too sure what kind of problem you’ve encountered with making stew gravy.. If I am not wrong, you meant your stew gravy was too watery. If so, I will suggest reducing a little amount of stock and make slightly more corn starch slurry to add into your dish. However, do not over-adding the slurry as your gravy will end up become very gluey, and not the right thicken texture. Remember to vote me at Best food blogger award, if I am up! Hee…. Your blog is a God sent to me. Im currently living and working in Sydney and have been struggling with my cooking. I regretted not spending enough time with my parents to learn about Singapore food and im certainly paying for it now. When i came across your website, i was so excited and you can never imagine the amount of time i spent on reading your blog. So a very very BIG THANK YOU to you for sharing your receipe. Im going to just ask you some very silly questions – if i need to make a soy bean soup, what kind of soy bean do i use? i bought a packet of “soy bean” from the Asian market but my friend told me that this is to make soy bean milk and not for soup? im confused. Can you help to clarify? Secondly, im currently 4 months pregnant and wonder what soup can i drink to nourish my body? i was advised against adding star anise and cinnamon sticks into my dishes. But i was so thrilled to try some of your braised pork dishes. Can you advise? Nice to see you here ( and thanks for doing this :)). 1) Yes, you can definitely use soy bean to cook soup, besides making sweet soya bean drink or sweet bean curd dessert (which reminds me of making my own sweet beancurd dessert – Tou Hua, again, someday). Soy bean is in pale yellowish/ beige colour, and correct, it is the same kind that use for making soy bean drink. I did not come across about any prohibition of star anise or cinnamon sticks. NO worries, I don’t think these ingredients matter at all. So, need not to avoid them, but as you know, everything you take now are sure to be on moderation, anyway. thanks for your kind reply. i’ll remain a loyal fan of yours. thanks for your dish.. all time fav..